This sketch is one of the few known oil studies for Hayter's 'Trial of Queen Caroline', NPG 999; his oil sketch of the Queen herself is NPG 4940. Holland took little part in the 'trial' beyond expressing emphatic support for a regular legal procedure instead of a secret committee. The picture presumably descended through Lord Holland's daughter and heir Mary Elizabeth who married Lord Lilford in 1830 and died aged 85 in 1891. It was not however in the Lilford House sale April 1942. A related pen and wash of a group with Lords Leinster, Liverpool and Brougham, Lord Holland standing with hat and stick, is in the British Museum, reproduced P. Quennell, Princess Lieven, 1937. 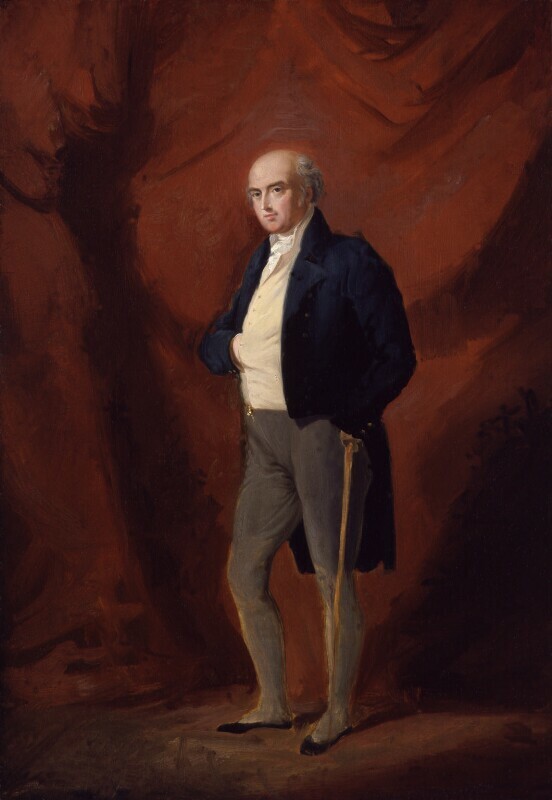 Whole-length standing to left with walking stick in dark blue tail-coat with brass buttons, grey trousers, buff waistcoat, white shirt-frill, black slippers, gold seal at waist; grey hair, bald on top, dark eyes, fresh complexion; red curtain background. Lord Lilford in 1903; William Drummond, Covent Garden Gallery, and given by him 1978.